BEIRUT, Apr 5 2015 (IPS) - In the Khalife workshop, in the southern coastal village of Sarafand, four men stand beside an oven, fixed in concentration despite the oppressive temperature. Blowing through a long tube, one of the group carefully shapes white-hot melted glass into a small ball, while two others coax it into the form of a beer glass. The fourth, the veteran of the group, cuts off the top of the glass, creating an opening from which beer will one day flow. Working in shifts, the members of Lebanon’s last dynasty of glass blowers work tirelessly day and night to ensure customers receive their products on time. Currently they are in the process of producing 133,000 artisan glasses commissioned by Almaza, a subsidiary of Heineken, and the most popular beer in Lebanon. When Ziad Abichaker phoned the Khalife family two years ago, they could not even dream of an order of such a size. The workshop’s oven had been idle for five months and the business was about to close. 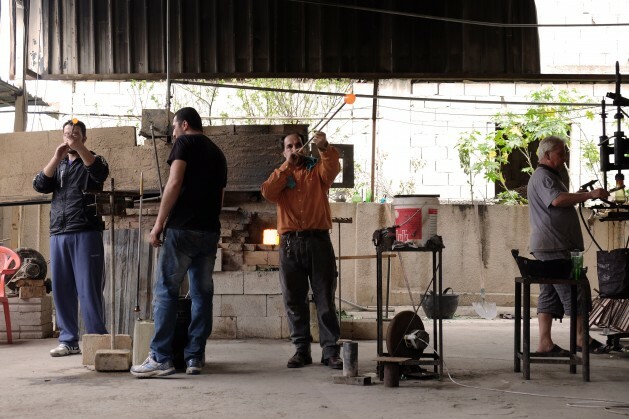 The Khalife family’s glassblowing workshop had relied heavily on Lebanon’s tourism industry to generate profits, but that was before the number of tourists started drying up due to fallout from the conflict in Syria. As manager Hussein Khalife explains, the workshop had relied heavily on Lebanon’s tourism industry to generate profits, but that was before the number of tourists started drying up due to fallout from the conflict in Syria. However, Abichaker, a multi-disciplinary engineer and owner of Cedar Environmental, an environmental and industrial engineering organisation that aims to build recycling plants to produce organically certified fertilisers, saw an opportunity to revive the family business. During the July 2006 war in Lebanon, Israeli airstrikes destroyed the country’s only green glass manufacturing plant, located in the Bekaa valley. Lacking investors to pump in the about 40 million dollars necessary to rebuild it, the plant has remained in a state of disrepair and as a consequence, local beer and wine companies have become reliant on importing their bottles. Abichaker – who operates ten municipal waste management plants through Cedar Environmental which had previously supplied the Bekaa glass plant – began stockpiling glass rather than see it end up in Lebanon’s landfills. “Around 71 million bottles end up in the landfills per year,” says Abichaker. “All the green glass that we sorted from the waste management plants had nowhere to go. I didn’t want to throw it away, so we started stocking the bottles while thinking of a solution”. By the time Abichaker started working with Hussein Khalife in 2013, he had already stocked around 60 tonnes of beer bottles. Together, they began working on a solution that would give new life to all the stocked glass, and also save the Khalife business. After putting together a business plan, they decided to create a number of new glass designs with a chic and modern finish as well as create more niche sales points. Besides glasses, the business plan also called for the production of cups, vases and lamps whose bases are made from recycled wood. Today, the initiative’s products are on sale in ten different locations in Beirut, including restaurants, alternative galleries and gift shops, and recently Abichaker and Khalife also started selling them online. After closing 2014 over 42,000 dollars up on sales, the Almaza order – GGRI’s biggest to date – came through and Abichaker is adamant that it will not be a one-off. The most recent step for the fledgling initiative was to raise funds to purchase a truck to pick up used glasses from bins they plan to place around some of Beirut’s more popular nightspots. A crowd-funding project last year raised 30,000 dollars. “I think that by the end of 2015 we will have diverted one million beer bottles from landfills,” estimates Abichaker, but while this is a considerable amount, it constitutes only a tiny portion of the 1.57 million of tonnes of solid waste that Lebanon produces per year, according to a 2010 report from SWEEP-Net, a regional solid waste exchange of information and expertise network in Mashreq and Maghreb countries. Currently, most of Lebanon’s green glass ends up in the landfill of the coastal municipality of Naameh, a town just south of Beirut. Created in 1997, the landfill was only meant to be active for six years due to environmental concerns. However, 18 years later it is still in use. Once again scheduled to close in January this year, the Lebanese government approved an extensions of the deadline for three months due to the absence of an alternative site. Abi Rached criticises the government for a perceived lack of commitment to developing recycling policies. The government, notes Abi Rached, award contracts to private sector waste management companies without prioritising environmentally friendly methods. In addition to the shortcomings of governmental waste-management programs, Abichaker argues that it is absolutely necessary to raise the general public’s awareness of the importance of protecting the environment.